Explore the deepest caves in Asia at Boi-Bulok where the depths reach 1,415m (4,641ft) in depth, and Kievskaya whose depths hit 990m (3,247ft). These are suitable for experienced cavers only. Beautiful gypsum formations can be seen at the Kugitang cave, while the caves of Baisuntau contain mummified bears and those in western Tian Shan feature underground rivers and lakes. Noted by many as one of the most interesting cities in the world, Bukhara, offers the visitor more than 350 mosques and 100 religious colleges to admire. At the centre of it all, is the Shakristan (the old town), where the Ark, or palace complex of the Emirs, can be found. Close by is the 47m-high (145ft) Kalyan Minaret. Other sites of interest in Bukhara include the covered bazaars, and the Kalyan Mosque which is open to non-Muslims. This is the place to do your shopping as everything from ikat fabric to silk road spices to Soviet memorabilia can be bought. Keep an eye out for snow tigers, the rare Tian-Shan grey bear and the Berkut eagle in the Chatkalsky Reserve, a narrow unspoilt gorge in the western Tian-Shan. In the winter months trekking, skiing and snowboarding are popular and there are chairlifts, a marked sledge route, skiing equipment rental and training sessions for beginners. Tashkent's Chorsu ('four ways') Bazaar is a typical, but especially lively, bustling Central Asian bazaar. Covered stalls protect the piles of fruit and vegetables from the hot sun, and it is possible to barter for souvenir-friendly slippers, shawls, carpets, gowns and skull-caps just as traders and merchants have done over hundreds of years. Cycle from Tashkent via Lake Aidarkul to Khiva. Easier rides can be done in the Ferghana Valley and around Tashkent, where lake and mountain scenery can be enjoyed. Organised tours are available. If climbing an ice waterfall appeals, Uzbekistan offers plenty of opportunity with its many mountains, ice climbing is possible on the Gissar, Matcha and Turkestan ridges. Also, vertical rock faces for rock climbing can be found in the Fan mountains (at Bodkhana, Chapdara, Maria-Mirali and Zamok) and on the Matchi Ridge (at Aksu, Asan-Usan and Sabakh). Khiva, northeast of Bukhara, is near to the modern and disappointingly uninteresting city of Urgench. Khiva, though, is fascinating. Completely and painstakingly preserved, the city still lies within its original walls, and has changed little since the 18th century. As a museum town it is hardly inhabited, which many visitors notice immediately, although it is possible to imagine what it was like in its prime – a place of plumed turbans and pomegranates. Built in the early 19th century, the Juma Mosque complex is centred around a 22m- (72 ft-) minaret and includes 98 red-wood columns brought from India. The entire compound has reverted to its former Soviet guise as a museum, with one room housing a collection of suzani (textiles) and ceramics from the region. Admission includes a free tour, but only in Russian. View the best collection of Russian avant-garde art outside St Petersburg in Nukus, the capital of Karakalpakstan, in the west of the country. It is also home to one of the largest collections of archeological objects and folk, applied and contemporary art originating from Central Asia. 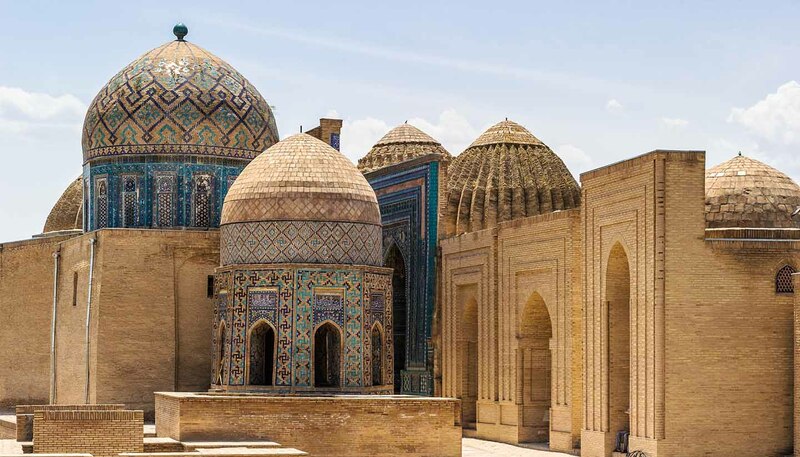 Other sites of interest in Samarkand include the Observatory of Ulug Beg, Timur's grandson, which was the most advanced astronomical observatory of its day. There is also the Afrasiab Museum, not far from the observatory, containing a frieze dating from the sixth century, which shows a train of gifts for the Sogdian ruler of the day. See the site of Alexander the Great's slaying of his friend Cleitos at Samarkand, the pivot of the Silk Road and the city transformed by Timur in the 14th century into one of the world's greatest capitals. Much of its past glory survives or has been restored. The centre of the historical town is the Registan Square, where three huge madrassas (Islamic seminaries) - including Shir-Dor and Tillya-Kari - built between the 15th and 17th centuries, dominate the area. Decorated with blue tiles and intricate mosaics, they give some idea of the grandeur that marked Samarkand in its heyday. The Bibi Khanym Mosque, not far from the Registan, is testimony to Timur's love for his wife. Now it is a pale shadow of its former self, having been partly destroyed in the 1897 earthquake, and seems permanently under repair. Timur himself is buried in the Gur Emir. On the ground floor, under the massive cupola, lie the ceremonial graves of Timur and his descendants. The stone that commemorates Timur is reputed to be the largest chunk of Nephrite (jade) in the world. The actual bodies are situated in the basement, which unfortunately is not open to the public. The Shah-i-Zinda is a collection of the graves of some of Samarkand's dignitaries. The oldest date from the 14th century as Samarkand was starting to recover from the depredations of the Mongol hordes of the 13th century. Its shiny restoration in 2005, remains controversial. The mountain resort of Beldersay, covered with snow in the winter months, and juniper and apple forests in the spring and summer, is located 80km to the southeast of Tashkent. The Beldersay route, divided into three skiing zones, is registered in the FIS (Federation of International Skiing) and has a length of 3020m (9900 ft). Compare old and new in Tashkent. The capital preserves only a small proportion of its architectural past. A massive earthquake in 1966 flattened much of the old city and it was rebuilt with broad, tree-lined streets. The new buildings are of little architectural interest but earlier buildings lie in the old town to the west. A myriad of narrow winding alleys, it stands in stark contrast to the more modern Tashkent. Of interest among the older buildings are the 16th-century Kukeldash Madrasa and the Kaffali-Shash Mausoleum. Many of the Islamic sites in Tashkent are not open to non-Muslims, and visitors should always ask permission before entering a mosque or any other religious building. Tashkent has many museums to explore. The eccentric State Fine Arts Museum of Uzbekistan is one of the most popular and aside from the Soviet masterpieces and the Uzbek art that dominates the ground and first floors, out the back is the wonderful Fidoliyar garden which is full of the graves of Bolsheviks who died in revolutionary street fighting. Elsewhere in the city there is the Museum of Applied Arts, a Literary Museum (Alisher Navoi Literary Museum) and the Art Gallery of Uzbekistan. Trek in the mountains in the south of the country. There are high peaks for those wanting a challenge, while easier treks can be done in the foothills and on the plateaux. The best time to go is between March and November. There is superb hiking along the spurs and gorges of the Chatkal Range to the ancient silver mine in the Chatkal Natiore Preserve.